1982 was the final model year that the X1/9 coupe that had debuted in 1974 was sold under the Fiat name—after that, it would be marketed under the Bertone name as Fiat withdrew from the United States. The X1/9 was small; at 156.3 inches in length, it was more than three inches shorter than today’s Fiat 124 Spider. 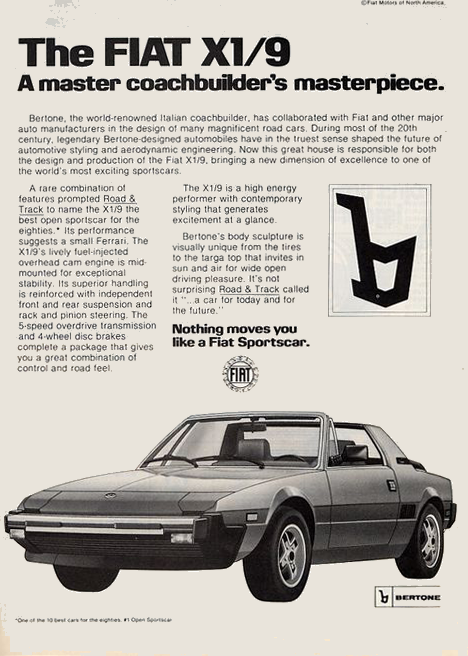 With its wedge shape, the X1/9 was part of a design trend in inexpensive sports coupes that included the Triumph TR7/TR8, the Pontiac Fiero, and the Toyota MR2. The only powertrain available on the X1/9 continued to be a 75 bhp 3.5 liter/91 ci inline four with Bosch L-Jetronic fuel injection paired with a five-speed manual. An X1/9 owner could expect a 0-60 time of a little over 11 seconds in a coupe with a curb weight of 2,209 pounds. Mileage wasn’t as good as you would think: rated at 26 city/37 highway by 1982 standards (20/26 by today’s calculation). With a 12.7-gallon gas tank, the driver of an X1/9 could expect a range of between 265 and 360 miles with a 10% fuel reserve. Standard equipment on the $10,900 X1/9 (about $29,400 in today’s dollars or about what a 2019 Fiat 124 Spider Abarth convertible goes for) included pop-up headlights, a removable targa roof, rack-and-pinion steering, four-wheel disc brakes, and Pirelli Cinturato P3 P165/70R13 tires (a size still available thanks to Vredestein) on 13 x 5.5 inch wheels. Inside, bucket seats, a four-spoke padded steering wheel, a lockable glove box, and full instrumentation were included. Options included metallic paint, tinted glass, air conditioning, and an AM/FM stereo radio. The X1/9 has a following in both its Fiat and Bertone versions. According to Hagerty’s valuation tools, all the money for a 1982 X1/9 in #1/Concours condition is $19,800, with a more normal #3/Good car going for $6,300. X1/9s come up for sale every once in a while in the Hemming’s Motor News classifieds or on eBay Motors. As I write this in February 2019, there’s a 1979 Black Metallic X1/9 with tan/black vinyl seats and 83,000 miles available for $10,500. While dropping my parents off at church this Sunday morning, I saw a stock-appearing facelifted fourth-generation Grand Prix with two-tone paint out of the corner of my eye—heading west on the Lincoln Highway. As good a reason as any to finally complete this blog post that I’ve been working on for over six months. 1987 marked the final model year for the G-body Grand Prix coupe—it would be replaced in 1988 by an all-new W-body front-wheel-drive model. Changes were few; the Grand Prix portion of Pontiac’s 1987 brochure emphasized a new sport steering wheel and new 45/55 seats for the LE. The standard Grand Prix powertrain continued to be the LD5 110 bhp 3.8 liter/231 ci V6 with a two-barrel carburetor paired with a three-speed automatic. Optional engines included the LB4 140 bhp 4.3 liter/263 ci V6 with fuel injection ($200 and available with either a three-speed or a four-speed automatic) and the LG4 150 bhp 5.0 liter/305 ci V8 with a four-barrel carburetor ($590 and only available with a $175 four-speed automatic). With the V8, a Grand Prix owner could expect a 0-60 time of a little over nine seconds in a coupe with a shipping weight of 3,231 pounds. Mileage wasn’t good with any engine/transmission combination: the best was the 4.3 liter/four-speed automatic combination with 19 city/26 highway (17/24 by today’s standards). Predictably, the V8 was the worst, at 17 city/24 highway—with a 13.6-gallon gas tank the owner of a V8 Grand Prix could expect a range of between 225 and 250 miles with a 10% fuel reserve. Standard equipment on the $11,069 Grand Prix (about $25,300 in 2019 dollars) included power steering, power front disc/rear drum brakes, and P195/75R14 blackwall tires (a size still available thanks to Hankook and Kumho) on 14-inch wheels. General Motors was moving to option groups in the late eighties, and the base Grand Prix had two. Option Group I $1,313) included dual sport sideview mirrors, body side moldings, air conditioning with Soft Ray tinted glass, a tilt steering wheel that was also a luxury cushion steering wheel, and a Delco ETR AM/FM stereo radio. Option Group II ($1,867) added cruise control, lamp group, controlled cycle windshield wipers, power door locks, and power windows. Moving up to the LE ($11,799) added dual sport sideview mirrors, 45/55 notchback seats in Pallex cloth, and a four-spoke sport steering wheel. For the LE, Option Group I ($1,844) included body side moldings, air conditioning with Soft Ray tinted glass, a tilt steering wheel, cruise control, lamp group, controlled cycle windshield wipers, power door locks, power windows, a visor vanity mirror, and a Delco ETR AM/FM stereo radio. Option Group II ($2,117) added halogen headlamps, a deck lid release, and a power driver’s seat, and made the visor vanity mirror illuminated. The top-of-the-line Brougham ($12,519) added 45/55 notchback seats in Majestic cloth, power windows, special trim, and a luxury cushion steering wheel. Option Group I ($1,874) for the Brougham included body side moldings, air conditioning with Soft Ray tinted glass, a tilt steering wheel, a power driver’s seat, cruise control, lamp group, controlled cycle windshield wipers, power door locks, a visor vanity mirror, and a Delco ETR AM/FM stereo radio. Option Group II ($2,078) added halogen headlamps, cornering lamps, luggage compartment trim, a deck lid release, dual remote mirrors, and a dome reading lamp, and added illumination to the visor vanity mirror. A Brougham with Option Package 2, the V8, and the four-speed automatic came to a non-trivial $15,362 (about $35,100 in today’s dollars or about what a 2019 Buick Regal Avenir sedan goes for). Individual exterior and mechanical options included a rally-tuned suspension ($50), a power sunroof ($925), a hatch roof with removable glass panels ($905), a power antenna ($70), two-tone paint ($205 to $295) and turbo-finned cast aluminum wheels ($246). Inside, you could get bucket seats with recliners and console ($292 with Ripple cloth in the base coupe, $69 with Pallex cloth in the LE, or $369 with leather in the LE), and a rally gauge cluster with tachometer ($153) along with a range of stereos up to a Delco ETR AM/FM stereo radio with cassette and graphic equalizer ($450). 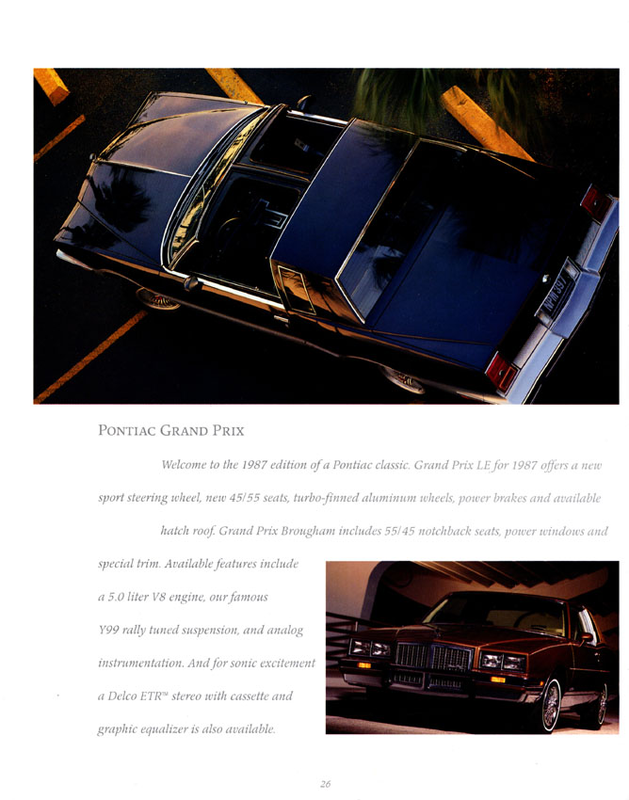 Grand Prix page from the 1987 Pontiac brochure. The 1987 Grand Prix did not sell well—sales were about 41% of the 1986 total, and, at 16,542, the typical Pontiac dealer sold more Grand Ams, 6000s, Bonnevilles, Sunbirds, Firebirds, and Fieros. Evidently (based on my observation this morning) someone is saving these cars! Hagerty declines to value any Grand Prix after 1977, but this generation does come up for sale every once in a while in the Hemming’s Motor News classifieds or on eBay Motors. As I write this in February 2019, there’s a 1985 Silver/Medium Gray two-tone Grand Prix LE with gray cloth notchback seats, a 3.8 liter/231 ci V6, an automatic, and 54,000 miles available for $12,900. Other rear-wheel drive G-platform (designated A-platform before 1982) cars I have written about include the 1984 Buick Regal Grand National coupe, the 1983 Chevrolet Malibu sedan, the 1981 Chevrolet Monte Carlo Sport Coupe, the 1981 Oldsmobile Cutlass Supreme coupe, and the 1980 Pontiac Grand Am coupe. Make mine Dark Maroon Metallic, please. 1987 was the first year for the T Type version of Buick’s sixth-generation LeSabre. Looking toward a looming future where the rear-wheel-drive Regal would no longer exist, Buick did its best to inject some sportiness into these big front-wheel-drive coupes. Power wasn’t great—the only engine available on any LeSabre was the 3.8 liter/231 ci sequential fuel injected V-6 making 150 horsepower and mated to a four-speed automatic transmission. 0-60 came in a little over 10 seconds in the 3,250-pound coupe—sprightly but not speedy in 1987. Fuel economy was 18 city/27 highway by the standards of the day (16/25 by 2018 standards). With an 18-gallon fuel tank, a LeSabre owner could expect a range of about 330 to 365 miles. Exterior and mechanical features specific to the $15,591 T Type (about $35,500 in 2018 dollars or about what a 2019 Buick LaCrosse Preferred sedan goes for) included blackout trim treatment, a front air dam, a rear deck spoiler, a Gran Touring suspension, a 2.97 performance axle ratio, and 215/65R15 Goodyear Eagle GT blackwall tires (a size still readily available) on 15-inch aluminum alloy wheels. Inside, a leather-wrapped sport steering wheel, gray/black 45/45 cloth seats, a gage package with red backlighting, and an ETR AM-FM stereo radio with graphic equalizer, cassette tape, and more red backlighting were included. 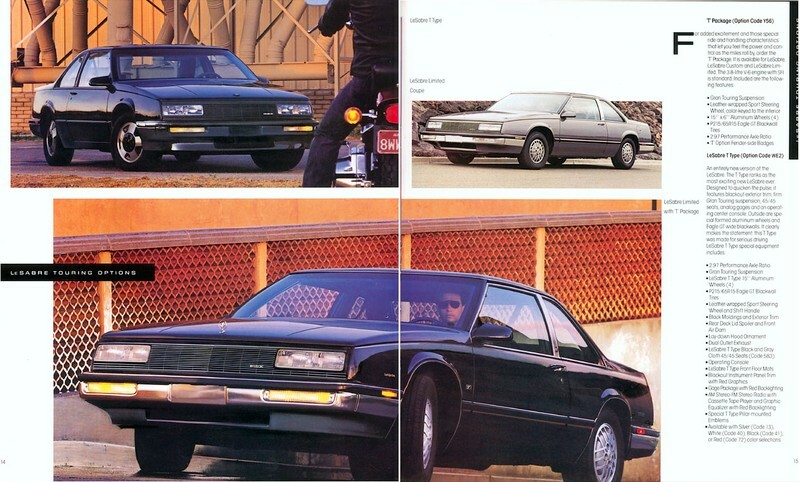 Standard exterior and mechanical equipment on all LeSabre coupes included composite tungsten halogen headlamps, power rack and pinion steering, clearcoat paint, dual horns, Soft-Ray tinted glass, and a fixed-mast radio antenna. Inside, air conditioning, adjustable front-seat headrests, and cut-pile carpeting were standard. Exterior and mechanical options included an anti-lock brake system ($925), flip-open Vista-Vent removable glass sunroof ($350), electric side mirrors ($91), intermittent windshield wipers ($55), and power antenna ($95). Inside, automatic climate control ($165), power door locks ($145) power windows ($210), tilt steering column ($125), and electronic cruise control ($175) were available. LeSabre pages from the 1987 “Hot Buick” brochure, linked from the Old Car Manual Project’s amazing brochures section. The automotive press and the auto market itself weren’t quite sure what to make of the LeSabre T Type—Consumer Guide said: “it had nothing exceptional to rave about.” Sales were not good in a year when the LeSabre overall sold quite well; only 4,123 out of the 16,899 coupes sold. A few folks do collect these cars, but I haven’t seen a LeSabre coupe of any type for many years. This generation of LeSabres does maintain some presence in the Hemming’s Motor News classifieds and on eBay Motors—however, there are none for sale as I write this in February 2019. Make mine Dark Blue Metallic, please. 1980 was the second year for the Fox-body Mustang and brought few changes from the debut year—and some of those weren’t great, such as a downgraded V8. The Cobra inherited some features from 1979 Pace Car, including a front spoiler, dual fog lamps, and a rear deck spoiler. The standard powertrain on the base Mustang was Ford’s Lima 88 bhp 2.3 liter/140 ci inline four with a Motorcraft 5200 two-barrel carburetor matched with a four-speed manual. A Windsor 119 bhp 4.2 liter/255 ci V8 with a Motorcraft 2150 two-barrel carburetor was available with a three-speed automatic, but the top-of-the-line powertrain was a turbocharged version of the Lima inline four with a Holley 6500 two-barrel carburetor making 132 bhp paired with the four-speed manual. Thus, for 1980 the fastest available Mustang had a 0-60 time of a little under 11 seconds. With a 12.5-gallon fuel tank and 18 city/30 highway fuel mileage (about 15/25 by today’s standards), a Cobra‘s proud new owner could expect a range of about 225 to 270 miles with a 10% fuel reserve. Standard mechanical equipment on the $7,098 Cobra (about $23,700 in today’s dollars) included the turbocharged inline four, the four-speed manual, a “special suspension system” with heavy duty front and rear stabilizer bars and special shock valving, a sport-tuned exhaust with bright tailpipe extension, and Michelin TRX 190/65R390 tires (they’re still available!) on 15.3-inch forged aluminum wheels. Exterior equipment included dual remote styled mirrors and black lower bodyside paint. A Cobra‘s interior didn’t have many upgrades, but you did get an 8,000-rpm tachometer and a black engine-turned instrument panel applique. Standard equipment on all Mustang hatchback coupes included dual rectangular halogen headlamps, wraparound taillamps, a modified MacPherson strut front suspension, front disc/rear drum brakes, and rack and pinion steering. Inside, full instrumentation (tachometer, trip odometer, fuel/temperature/oil/alternator gauges), a sports steering wheel, color-keyed cut pile carpeting, all vinyl high-back bucket seats, a lockable glove box, and a cigarette lighter were included. Exterior and mechanical options included Cobra hood graphics ($88), a flip-up open air roof ($219), black liftgate louvers ($141), and a rear window/wiper washer ($79). Inside, you could choose SelectAir conditioning ($538), Recaro high-back bucket seats ($531), an electric rear window defroster ($96), interval windshield wipers ($39), tilt steering wheel ($78), and the power lock group ($113). A series of stereos were available, with the most capable being an AM/FM stereo radio with a cassette tape player ($271). Higher end stereos could be paired with the Premium Sound System ($94), which added a higher-power amplifier and more capable rear speakers. Cobra pages from the 1980 Ford Mustang brochure, linked from the Old Car Manual Project’s amazing brochures pages. Folks are definitely collecting these early Fox-body Mustangs. Cobras come up for sale every once in a while in the Hemming’s Motor News classifieds or on eBay Motors, though there aren’t any available right now. According to Hagerty’s valuation tools, all the money for a 1980 Cobra in #1/Concours condition is an astounding $23,100, with a more normal #3/Good car going for $9,800. Make mine Black, I think, perhaps with those extra-cost Cobra hood graphics. Later Fox-body Mustangs I have covered include the 1982 GT hatchback coupe, the 1983 GT convertible, and the 1984 SVO hatchback coupe. I guess I’ll have to get to the second half of the Mustang’s decade at some point. For 1986, Cadillac transitioned the Fleetwood Brougham from the Cadillac-built HT-4100 130 bhp 4.1 liter/249 ci V8 with fuel injection to the Oldsmobile-built 140 bhp 5.0 liter/307 ci V8 with a Rochester four-barrel carburetor. Production for the model year started late—it didn’t get going until February 1986. The only powertrain available mated the aforementioned V8 to a four-speed automatic transmission. Mileage was rated at 18 city/25 highway by the standards of the day (16/23 by today’s standards). With a 20.7-gallon fuel tank, a Fleetwood Brougham buyer could expect a range of between 365 and 400 miles with a 10% reserve. The target market didn’t really care about performance, but the 0-60 time was a little under 13 seconds. Standard exterior and mechanical equipment on the $21,265 Fleetwood Brougham (about $48,900 in today’s dollars or about what a base 2019 Cadillac CT6 sedan goes for) included rear wheel drive, power front disc/rear drum brakes, Soft Ray tinted glass, a full padded roof treatment, and P215/75R15 steel-belted all-season radial whitewall tires (a size still readily available, including in whitewall) on 15-inch wheels. Inside, an illuminated entry system, power door locks, power windows, electronic climate control, and dual comfort 55/45 heather cloth seats with six-way power adjuster for the driver were all included in these comfortably equipped cars. Upgrading to the Sedan d’Elegance added adjustable rear seat reading lamps, controlled cycle wipers, tufted pillow-style seating areas, a six-way power seat and manual recliner for the front passenger, and an AM/FM stereo radio with power antenna. Among the many exterior and mechanical options were the electrically powered Astroroof ($1,255), electronic level control ($203), and wire wheels ($860 to $940). Inside, Twilight Sentinel ($85), automatic door locks ($170), power trunk lid release ($40), and driver’s side memory seat ($215) were available. Sedan d’Elegance pages from the 1986 Cadillac Fleetwood Brougham brochure, linked from Hans Tore Tangerud’s lov2xlr8 website. The 1986 Fleetwood Brougham sold decently, especially considering the short year—49,115 examples went out the door. In 1987, the name was shortened to just Brougham, but Cadillac would sell the same basic model through the 1992 model year with only one notable update in 1990. Folks are collecting these rear wheel drive eighties Cadillacs, but values do not approach those of Fleetwoods from previous decades. According to Hagerty’s valuation tools, all the money for a 1986 Fleetwood Brougham sedan in #1/Concours condition is a painfully low $8,000, with a more normal number #3/Good condition car going for $4,200. Eighties Fleetwood Broughams and their ilk are regularly featured in the Hemming’s Motor News classifieds and on eBay Motors—as I write this in February 2019 there’s a Cotillion White 1986 with burgundy velour seats and 44,000 miles available on Hemmings for $11,000. Make mine Autumn Maple Firemist, please. As always, the January auction at Barrett-Jackson Scottsdale provided some interesting fodder for commentary, along with a compare/contrast to Mecum Kissimmee, which comes about one week earlier. I’ll concentrate on the at least fairly stock 1980s cars and trucks that sold and add some of my opinions; I’ll leave the motorcycles and automobilia to others. Eighties vehicles were reasonably present at Barrett-Jackson Scottsdale—about 4% of the 1,692 relevant lots. 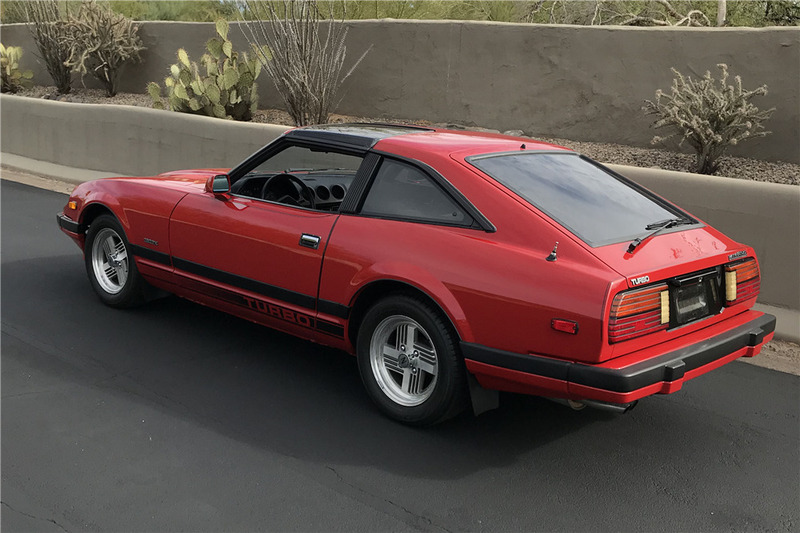 1983 Red Datsun 280ZX Turbo hatchback coupe with gray cloth seats, an L28E 180 bhp 2.8 liter/168 ci inline six with Bosch L-Jetronic fuel injection and turbocharger, and a five-speed manual—$7,500 hammer price for the rarely seen 2+2 version of the Z car. 1983 Datsun 280ZX, linked from Barrett-Jackson’s website. 1980 white Chevrolet Camaro Z28 coupe with carmine cloth seats, an LM1 190 bhp 5.7 liter/350 ci V8 with a Rochester four-barrel carburetor, a four-speed manual, and 76,000 miles. At $14,500, the first vehicle in this auction to meet my criteria for serious 1980s collectability of original cars or trucks: selling for equal to or above its original base list price. I’ll mark these vehicles in bold green. 1980 Black Chevrolet Corvette custom (body, interior) convertible with tan seats, a 5.7 liter/350 ci V8, and an automatic—$17,500 for this Ferrari Daytona imitation. 1986 Crystal Green Metallic Porsche 944 Turbo hatchback coupe with burgundy leather seats, a 220 bhp 2.5 liter/151 ci inline four with fuel injection and turbocharger, and a five-speed manual—$11,000 for this very different (but correct) Porsche color. 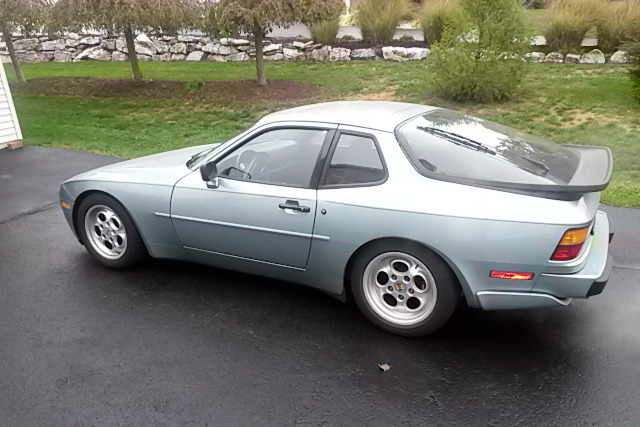 1986 Porsche 944 Turbo, linked from Barrett-Jackson’s website. 1987 White Buick Regal Limited coupe with blue cloth seats, an LC2 245 bhp 3.8 liter/231 ci V6 with turbocharging and fuel injection, an automatic, and 55,000 miles—$38,500 for this relatively rare (one of 1,035 built) car that has the turbo but doesn’t have the “Darth Buick” look. 1983 White Chevrolet Camaro Berlinetta hatchback coupe with gray cloth seats, a 150 bhp 5.0 liter/305 ci V8 with a four-barrel carburetor, a five-speed manual, and 11,000 miles—$7,500. As soon as I write that you never see Berlinettas, they start showing up at auction. 1987 Dark Gray Metallic Subaru BRAT pickup truck with gray cloth/vinyl seats, an EA-81 73 bhp 1.8 liter/109 ci flat four, a four-speed manual, and 27,000 miles—$16,500. Two BRATs in one auction! 1988 Black Ford Thunderbird Turbo Coupe with scarlet red cloth seats, a Lima 150 bhp 2.3 liter/140 ci inline four with fuel injection and turbocharger, an automatic, and 9,400 miles—$7,000. Suddenly, eighties Thunderbirds are showing up at auction. 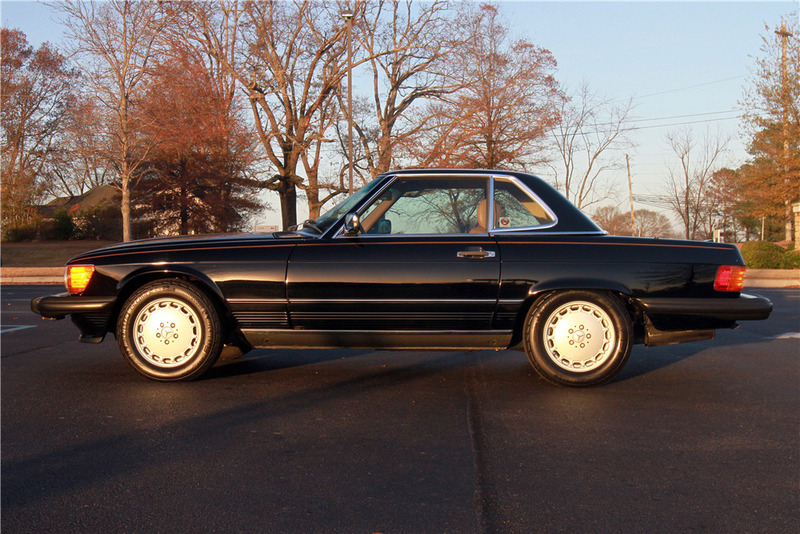 1989 Black Mercedes-Benz 560SL convertible with palomino leather seats, a 227 bhp 5.5 liter/338 cubic inch V8 with Bosch KE-Jetronic fuel injection, an automatic, and 15,000 miles—$45,000 marks this as a very nice 560SL. 1989 Mercedes-Benz 560SL, linked from Barrett-Jackson’s website. 1989 Tan Mercedes-Benz 300TE station wagon with tan seats, a 217 bhp 3.2 liter/180 ci inline six, and an automatic—$14,500 for this wagon once owned by Shirley Temple Black. 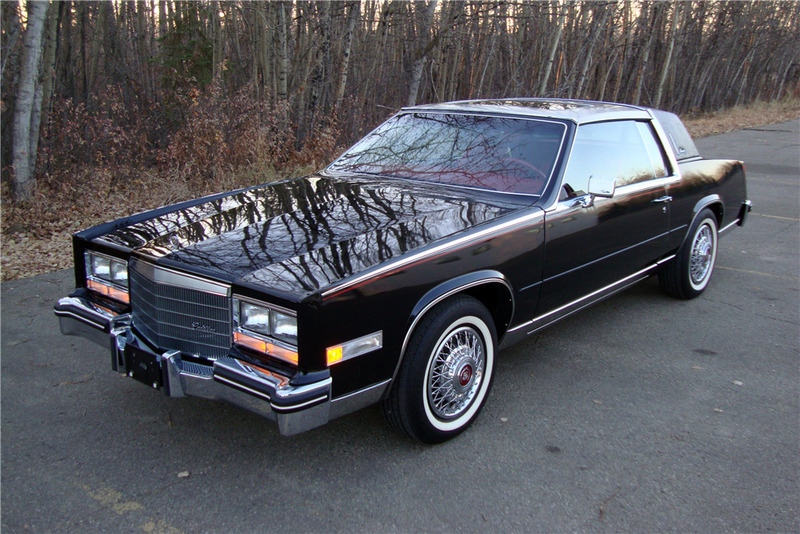 1985 Tuxedo Black Cadillac Eldorado Biarritz coupe with red tufted leather seats, an HT-4100 135 bhp 4.1 liter/249 ci V8 with fuel injection, and an automatic—$35,000 is serious money for an eighties Eldo, much less a coupe. 1985 Cadillac Eldorado Biarritz, linked from Barrett-Jackson’s website. 1986 White Pontiac Grand Prix race car with a black race seat, a 5.7 liter/350 ci V8, and a four-speed manual—$100,000 for this car once raced by Rusty Wallace. 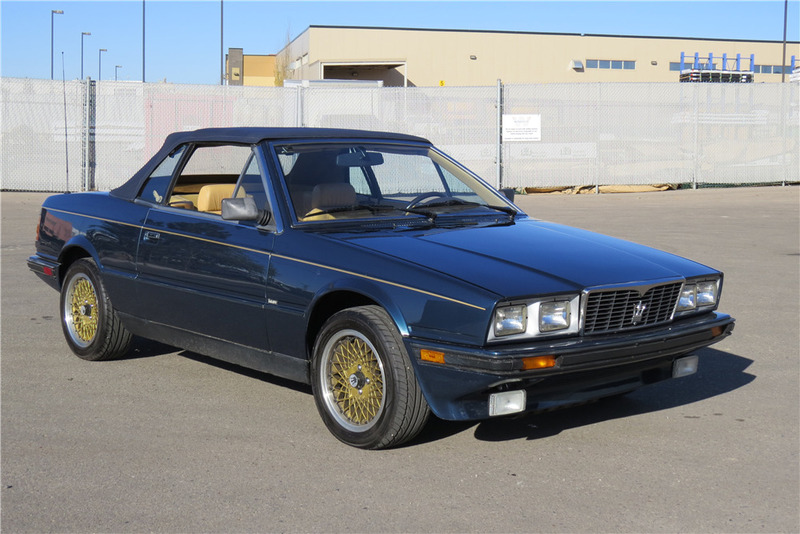 1987 Blue Maserati Biturbo Spyder with a blue top, tan leather seats, a 187 bhp 2.0 liter/122 ci V6 with fuel injection and (natch!) twin turbochargers, an automatic (why? ), and 8,300 miles—$7,500 for the most unusual eighties vehicle in this auction. 1987 Maserati Biturbo, linked from Barrett-Jackson’s website. 1980 Black/Gold Pontiac Firebird Trans Am Special Edition coupe with dark camel cloth seats, a 150 bhp 4.9 liter/301 ci V8 with a four-barrel carburetor, an automatic, and 781 miles—an astounding $77,000. Hagerty’s valuation tools show all the money for a 1980 Special Edition in #1/Concours condition as being $53,400, with a 15% deduction for the automatic this car has. 1980 Burgundy Pontiac Firebird Trans Am custom (powertrain, body, paint, interior) coupe with tan leather seats, an LS1 5.7 liter/346 ci V8 with fuel injection, and an automatic—$42,000. 1981 White Jeep CJ-7 custom (paint, interior) SUV with black seats, a 4.2 liter/258 ci inline six, and a three-speed manual—$1.31 million for this charity car. 1982 Guards Red Porsche 911 Turbo custom (body, wheels/tires, engine?) coupe with black leather seats, a 3.3 liter flat six with fuel injection and turbocharger, a four-speed manual, and 53,000 miles—$100,000 for this (I believe) gray market car. Two 1987 Black Buick Grand National coupes with black/gray cloth seats, LC2 245 bhp 3.8 liter/231 ci V6s with turbocharging and fuel injection, and automatics—$61,000 for this pair, one with 600 miles and one with 900 miles. 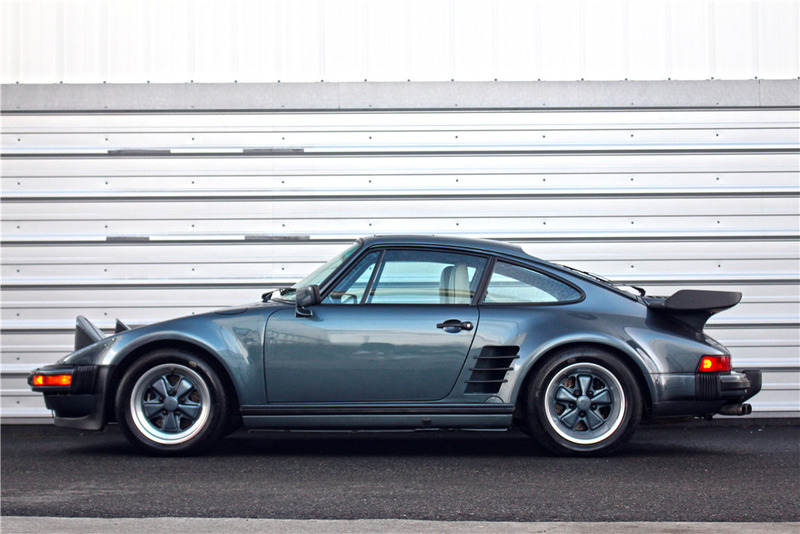 1988 Venetian Blue Metallic Porsche 911 Turbo factory slantnose coupe with pearl white leather seats, a 282 bhp 3.3 liter/201 ci flat six with fuel injection and turbocharger, a four-speed manual, and 23,000 miles—$150,000 shows that there are other colors besides Guards Red that attract eighties Porsche bidders. 1988 Porsche 911 Turbo, linked from Barrett-Jackson’s website. 1988 Rosso Corsa Ferrari Testarossa coupe with tan leather seats, a 380 bhp 4.9 liter/302 ci V12 with Bosch K-Jetronic fuel injection, a five-speed manual, and 1,000 miles—$200,000 means the bidders judged this car as the nicest of the three Testarossas in this auction. 1988 White Ferrari Testarossa coupe with white leather seats, a 380 bhp 4.9 liter/302 ci V12 with Bosch K-Jetronic fuel injection, a five-speed manual, and 3,600 miles—$130,000 for the Miami Vice version. 1980 Black Rolls-Royce Silver Wraith II custom (interior) sedan with cream leather seats, an L410 6.75 liter/412 ci V8 with Bosch fuel injection, and an automatic—$30,000 for this car previously owned by Erik Estrada and modified by the Unique Rides crew. This auction featured a lot of Chevrolets, Buicks, Pontiacs, and Porsches from the eighties. What do you think of this year’s results? This year’s huge January auction at Mecum Kissimmee provided some interesting fodder for commentary. I’ll concentrate on the reasonably stock 1980s cars (and a few trucks) that sold (remember that Mecum auctions are not “no reserve” auctions—a Guards Red 1989 Porsche 911 Speedster convertible with cashmere beige leather seats and 252 miles was a no sale bid up to $260,000) and add some of my opinions. Mecum Kissimmee is a huge event, so I’m going to separate it into two posts—this second post covers the eighties 6% of the approximately 1,270 vehicles sold from Tuesday through Sunday. 1987 Blue Jeep Comanche pickup truck with a gray interior, a 173 bhp 4.0 liter/242 ci inline six, and an automatic—$5,500 hammer price. 1984 Black GMC C15 Blackjack Edition pickup truck with a black vinyl bench seat, a 5.0 liter/305 ci v8, an automatic, and 56,000 miles—$13,500. I’ve never heard of a Blackjack Edition. 1981 Gray Volkswagen Rabbit LS hatchback sedan with beige vinyl seats, a 52 bhp 1.6 liter/97 ci diesel inline four, a five-speed manual, and 73,000 miles—$6,000. Who saves these cars? 1981 Volkswagen Rabbit, linked from Mecum’s website. 1985 Burgundy Cadillac Eldorado Biarritz coupe with red tufted leather seats, an HT-4100 135 bhp 4.1 liter/249 ci V8 with fuel injection, an automatic, and 46,000 miles—$10,000 for this attractive top-of-the-line Cadillac coupe. 1985 Cadillac Eldorado, linked from Mecum’s website. 1985 White Pontiac Firebird Trans Am Kammback station wagon with gray leather seats, an “H.O.” L69 190 bhp 5.0 liter/305 ci V8 with a four-barrel carburetor, and a five-speed manual—$37,000 for one of four experimental eighties Kammbacks. 1985 Pontiac Firebird Trans Am Kammback, linked from Mecum’s website. 1983 Blue Audi Quattro hatchback coupe with brown leather seats, a 156 bhp 2.1 liter/131 ci inline five with Bosch K-Jetronic fuel injection and turbocharger, and a five-speed manual—$25,000. Are we going to start seeing more of these rare and pricey when new Quattros at auction? 1983 Audi Quattro, linked from Mecum’s website. 1989 Jet Black Mercedes-Benz 560SL convertible with palomino leather seats, an M117 238 bhp 5.5 liter/339 ci V8 with fuel injection, an automatic, and 19,000 miles—$53,500 is a lot for a 560SL, somewhere between #1/Concours and #2/Excellent money, according to Hagerty’s valuation tools. 1983 Rosso Corso Ferrari 512 BBi coupe with tan leather seats, a 335 bhp 4.9 liter/302 ci flat 12 with Bosch K-Jetronic fuel injection, a five-speed manual, and 8,400 miles—at $250,000, the highest eighties vehicle sale of this auction. 1983 Ferrari 512 BBi, linked from Mecum’s website. 1988 Black Oldsmobile Cutlass Supreme Pace Car Edition convertible with a black top, gray cloth seats, an LB6 130 bhp 2.8 liter/173 ci V6 with fuel injection, an automatic, and 618 miles—$24,500 for this rarely seen car (most of the 50 built were bought back by Oldsmobile). 1988 Oldsmobile Cutlass Supreme, linked from Mecum’s website. 1983 Black Porsche 911 Turbo custom (slantnose conversion) coupe with black leather seats, a 296 bhp 3.2 liter/202 ci flat six with fuel injection and turbocharger, and a four-speed manual—$32,000 for this (I believe) gray market car. Chevrolet had their usual dominance among eighties vehicles (30% of the total), but I thought the big story for this decade at Kissimmee was the onslaught of the Land Cruisers, which put Toyota in a solid second place with 10%. Following reasonably closely were Ford (8%) and Jeep (7%).